Tokyo July 13 (IANS) A search operation continued on Friday to locate 127 missing people after torrential rains and floods lashed Japan and left 204 others dead. Nearly 73 000 army police and fire brigade personnel continue to look for the missing with 81 helicopters deployed in the operations on Friday Efe news quoted government spokesperson Yoshihide Suga as saying. 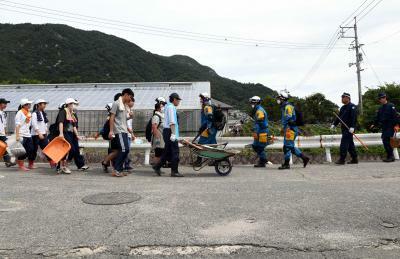 Prime Minister Shinzo Abe expressed his gratitude to 5 500 volunteers who were looking after 7 000 people still in temporary shelters on Thursday a week after the rains hit Japan mainly around Hiroshima and Okayama. More volunteers are expected in the areas over the next three days and Abe asked authorities to take measures for to guarantee safety and against the heat according to public broadcaster NHK. According to the Japan Meteorological Agency the temperature is expected to rise above 30 degrees Celsius during the next few days in several areas hit by the disaster which has led to concerns about possible heat stroke and infectious diseases among people in temporary shelters and rescuers. On Friday Abe is expected to visit Ehime (west) another one of the worst hit prefectures to meet with the people in shelters and to appraise the situation. Some 207 000 households remain without water while power and gas supplies have been restored NHK reported. The record rainfall in the Japanese archipelago which in several places in just 11 days reached four times the usual total volume for July led to floods and landslides hitting thousands of homes and cutting off access to several neighbourhoods.